I always knew that flax had strong health benefits and I would often use the linseed variety in salads, smoothies or bread. 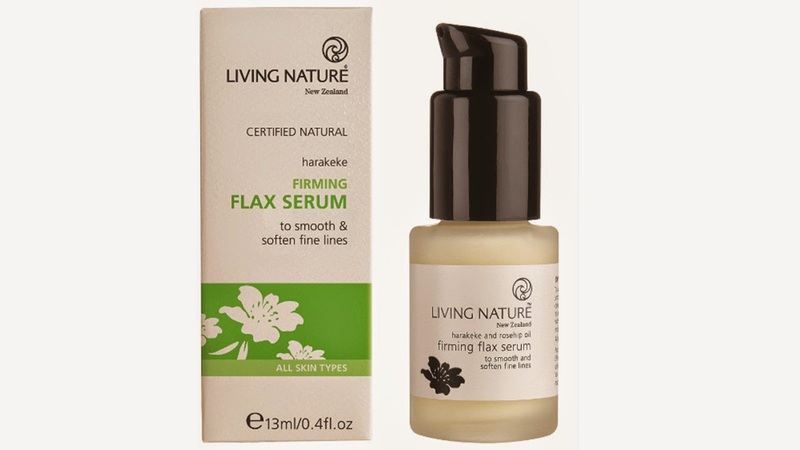 I never imagined I would use flax as part of a skincare routine until I received a sample of Living Nature’s award winning Firming Flax Serum. I am a bit of a fan of a number of Living Nature’s (www.livingnature.com) clever natural products and was very happy to try this out. The harakeke flax gel that is used in this serum acts like a mild astringent on the skin, causing a contraction of pores and resulting in moisture being trapped in. I had never heard of this ingredient before but was eased after reading it is more potent than the wondrous aloe vera. After doing a bit of research I found that the harakeke flax plant did not look too dissimilar to aloe vera. This flax gel is blended together with rosehip oil and active manuka honey to create a serum that nourishes the skin and rejuvenates it. A great product in the fight against fine lines. My skin was noticeably smoother but the serum felt different to most serums I have tried. It did not instantly make my skin feel nourished, that came after, but I was more aware of a gentle contracting across my face …..result! I did find myself wondering how much of this product was an appropriate amount to use to tackle my forehead lines…..not that I am paranoid about them…. should I go for another layer of product to test how much contraction was possible? More is more but I restrained… a little. This 100% natural and oil free serum is really light to apply. You hardly notice it is on your skin until you feel the mild tightening sensation. This is not unpleasant. It makes sense to apply after cleansing and hydrating but before your moisturiser. I wasn’t sure that I would like this product as it does not contain my normal “go to” ingredients, but I was pleasantly surprised how this different approach felt on my skin. I did like how it locks in all the moisture, without leaving any grease on my skin. I found it super easy to apply make up afterwards. Ingredients :- Aqua (water), Simmondsia chinensis (jojoba) seed oil**, Cetearyl olivate, Sorbitan olivate, Vitis vinifera (grape) seed oil, Caprylic/Capric triglyceride, Glucose, Mel (manuka honey), Phormium tenax leaf juice (NZ flax gel), Sclerotium gum, Calendula officinalis (calendula) extract**, Euphrasia officinalis (eye bright) extract, Parfum (fragrance)*, Daucus carota (carrot) extract, Rosa canina (rosehip) fruit oil**, Triticum vulgare (wheat) germ oil, Oenothera biennis (evening primrose) oil**, Glucose oxidase, Lactoperoxidase, Tocopherol (vitamin E), Hypericum perforatum (st johns wort) oil. *From natural essential oils: Limonene, Linalool. **Certified organic. Previous Post Summer is back???…. just for this afternoon?